A doula is a lay woman who offers emotional and practical support to women, and their families, during pregnancy, childbirth and early parenthood. Doula UK is a non-profit association of doulas operating across the UK. All members of Doula UK work within the guidance of its Code of Conduct and adhere to its philosophy. 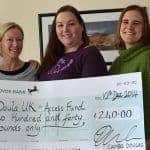 Doula UK operates the Doula Access Fund which allows parents who might otherwise not be able to benefit from the support of a doula to do so. A doula (from the Greek word meaning ‘female slave’) offers continuous emotional and practical support, for mothers and couples, through pregnancy, birth and the immediate postnatal time, as well as providing flexible practical and emotional support postnatally for new mothers and families in their own homes. Doulas are usually experienced women who have completed some basic training. Doulas do not take a clinical role and work alongside midwives and doctors. They do not advise, but can support a woman to find balanced information to make informed decisions about her maternity care. The doula is supporting the whole family to ensure as positive a birth experience and postnatal period as possible. A doula believes in “mothering the mother”, enabling a woman to have the most satisfying and empowered time she can during pregnancy, birth and in the early days as a new mum. This type of support helps the whole family to relax and enjoy the experience. As childbirth has moved from home to hospital, and our society has become more fractured, with smaller families and people often moving away from their immediate families before having children, a vital element of care has been lost from the whole process. Gone are the days where a woman would have continuous support from one carer throughout her pregnancy and labour. Now, even if a women mostly sees one midwife throughout her doula.org.uk pregnancy, it is rare for that midwife to be the one supporting her during birth. Doulas aren’t midwives and cannot take on the role of a midwife, but one of the many reasons given for hiring a doula is so as to have a familiar friendly face at the birth. The role of a doula is a very old role and, historically, most women would have had experienced women – womenfolk within the immediate and extended family (mothers/sisters/grandmother etc) and local community – to support them through pregnancy, labour & birth and then postnatally. With smaller families, fractured and larger communities, many adults moving away from their immediate families before having their own children and the medicalisation of birth and reduction in breastfeeding rates over the last century, the non-medical, nurturing support from experienced women has been lost to many new mothers. This is the role doulas take on, enabling women to independently arrange the non-judgmental emotional and practical support they, and their family, want and need during the childbearing year. Members of Doula UK all complete a Doula UK Approved Course which follows the specialist Doula UK Core Curriculum. In order to move from Mentored doula status to Recognised doula status, a doula has the support of an experienced Doula Mentor whilst undertaking and reflecting in depth on a minimum of her first four birth and postnatal jobs. All members are obliged to continue their learning and to give proof of workshops and additional training undertaken each year. Services offered by a doula vary greatly according to the needs of the mother/parents-to-be. A doula’s role has to be flexible to fit in with the given situation e.g. the type of support will differ for a first-time mum to that of a woman who has children already. Every birth is unique and therefore every woman’s experience is also unique. Before childbirth the doula will usually meet with the mother (or couple) at least twice to talk through birth physiology, fears, expectations, previous experiences etc. She will be able to provide an unbiased viewpoint and signpost parents to seek out ALL relevant information, to enable them to make informed decisions about the care and type of birth they desire. The doula will typically go on-call (and be on-call 24/7) from the 38th week of pregnancy until the baby arrives. During labour the doula is a calm and constant presence and is, if necessary, able to offer comfort and suggestions on coping mechanisms such as breathing, relaxation, movement and positioning. The doula can also support the father to participate in the birth to a level at which he feels comfortable. The doula’s most important role is to provide reassurance, continuous support and nurturing (as this is proven to have dramatic results on the outcome of the birth and is something the NHS is often unable to provide). Postnatal doulas work flexible hours to suit the family, offering practical and emotional support to the new mother/parents in the home following the birth of the baby/babies. The doula’s role is empowering a family to take care of itself with encouragement, practical support around infant feeding, baby and sibling care and can include helping with domestic tasks, cooking, laundry etc. Doulas can be employed directly and paid by their clients, or may choose to volunteer – such as under the Doula UK Access Fund or with women’s refuge charities – or may be employed in the NHS, or paid by Social Services or Childrens’ Centres working with their clients. The cost of a doula birth package varies according to location and experience, but generally falls between £500 and £2000 for a Recognised doula. Mentored doulas with Doula UK, who are usually less experienced and are undergoing mentorship from an experienced doula, usually charge between £150-600 for a birth package. Postnatal doulas charge from upwards of £10 per hour. Doula UK also provides the Doula Access Fund, which enables women who would not otherwise be able to afford a doula to access support. The Access Fund covers a doula’s expenses but the doula gives her services voluntarily. Doula UK provides a free online ‘Find a Doula’ service for parents. Our network has a Philosophy, sets standards and has a Code of Conduct for all members adhere to. Members all complete a Doula UK Approved Course which follows the Doula UK Core Curriculum. Doula UK has a mentoring and recognition process to support members as they gain experience. All members are obliged to continue their learning and to give proof of workshops and additional study undertaken each year. Doula UK also has a Complaints Procedure, which amongst other things, allows us to audit our membership and maintain good practice. Doula UK gives peace of mind to clients who recognise the level of professionalism of the organisation and of the doulas they are choosing to employ. For more information about doulas and Doula UK please email admin@doula.org.uk or call 0871 4333103 – this number is answered by a member of the volunteer team between 9am – 6pm Monday to Friday., or you may be asked to leave a voicemail message. Spokespeople are available for interview and case-studies can be provided.